I may be taking a little liberty with the title, but this Kijiji Toronto ad (actually Cornwall) has some pretty specific preferences with room for interpretation as these randy broads seek a manservant for their dirty weekend. This ad has been making the rounds for a few weeks, but I don't think ANYONE has reported where these ladies work. I'm going to go out on a limb and guess that they work together at the Cornwall Community Hospital. Ladies, am I wrong? Group of ladies looking for a cabana boy for Cottage Weekend! 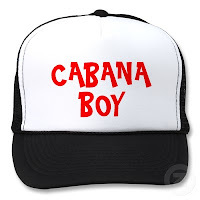 Looking for a young man (25-39 years), available the weekend of October 12-14, 2012 (4 day weekend) to serve as a cabana boy for four voluptuous, self-indulgent friends (34-37 years). You will have your own cabin for sleeping (bathroom is shared in the main house), separate from the house and transportation can be provided. We will be staying in the St. Jerome/St. Hippolyte area. Your meals will be provided and it’s BYOB if you have a specific preference (in other words…. we don’t usually bring beer). We will require a resume with two recent references. You will have the luxury of enjoying a beautiful cabin in the woods with a fire pit, fire place, canoe, paddle boat and kayak. The view is amazing. All you will need to bring in your clothing and personal items, everything else will be provided. There is usually no cell phone reception in the area(you have to walk up to the road) but there is a land line phone for emergencies. You will be given much free time throughout the weekend to enjoy the lake for swimming or water activities listed above or to explore the area. · Brown or black hair or even a ginger. · Physically fit/strong (more on the chunky side than the thin or ripped side). · The strong silent type but funny when appropriate. Relaxed and flexible. · Intelligence and the nerdy look is an asset, but not necessary, you can be dumb as dirt as long as you look pretty and are strong! · Non-smoker and drug free. · Owner of a loin cloth and a cowboy hat! · Ability to play the guitar is an asset. · Must be able to pass a criminal reference check. · No expectations as there will be no “benefits” with this position! · Must be willing to sign a non-disclosure agreement. · If you have an accent of any of the European varieties we may wave many of the previously listed preferences! · Will address all four ladies as Mistress and My Lady! · Unloading/Loading vehicles and carrying luggage etc… to the house (there are 4-5 flights of stairs to the cabin). · Making drinks, cooking meals and making smores. · Cleaning up after meals, doing dishes and garbage (we bring paper plates). · Assisting in fire making and maintaining (outside and inside). · Neck rubs when required! · Respecting our space and privacy when we require it. · End of weekend clean up as per the cabin instructions (stripping beds, garbage and sweeping). Please email with your required rate for the weekend, resume, recent pictures and contact information. Only selected applicants will be contacted for interview.